Our house is located in the northern part of the island, about an 8-minute walk to the gorgeous beach of Siesta Key and Siesta Village. In this area you find only private homes, surrounded by luscious tropical vegetation. You will find modern appliances and everything you would expect in a well-equipped kitchen, e.g. stove, microwave, dishwasher, blender, coffee maker, garbage disposal, etc. In the utility room there is a washer and dryer. The master bedroom has a king size bed and the second bedroom has a queen size bed (both are Stearns & Foster). The house is newly and very comfortable furnished and is well equipped with bed linens and towels. Just bring your personal items. It also has a full size pool table which is great if you happen to have a rainy day. Attached to the front of the house is your very private, screened in pool deck.. The patio furniture includes a bar/table with 6 chairs. The second story is totally independent of the first and is where Kevin and Laurel reside. Just a short walk takes you to Siesta Village. The stores there will meet all your vacation needs: swimwear, sandals and gifts, food, and beverages. We have a wide range of restaurants to choose from on Siesta Key. Please note: Minimum age to rent is now 25. 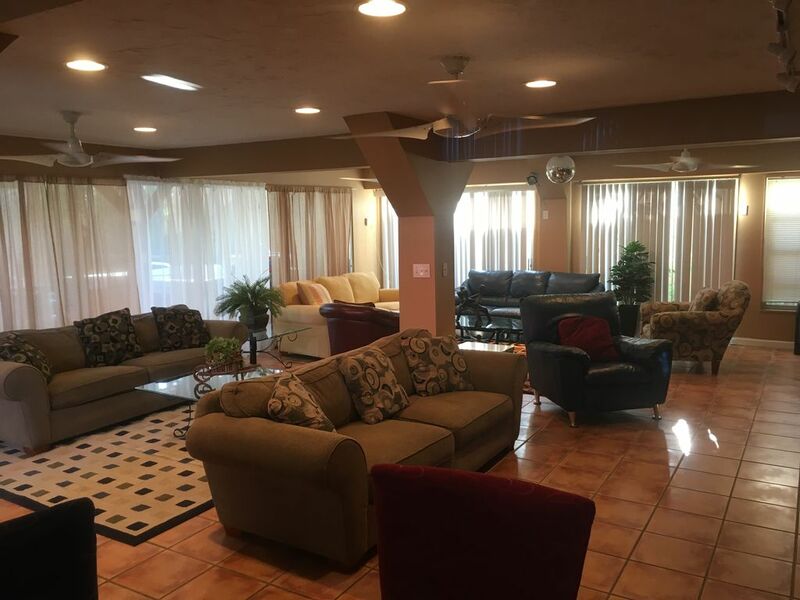 BR B Amenities: /B BR Phone, Air Conditioning, Cable TV, Stereo, VCR, CD Player, Full Kitchen, Microwave, Dishwasher, Refrigerator, Cooking Utensils, Linens & Towels, Washer, Dryer, Pool Table, Private Pool, Gas Grill, and Large Jacuzzi. BR B Area: /B BR 8 minutes to Siesta Beach and Village. The second bathroom is a modern design with a walk-in shower, toilet, and vanity. Includes a full kitchen with dishwasher, stove, refrigerator, freezer, blender, microwave, toaster, and coffee maker. The dining area includes a breakfast bar with 4 high chairs, and a dining room table with chairs. We provide a beach wagon so you can bring all your stuff to the beach. Pool is not heated. Pool may not be warm enough in December, January, and February. Private Large Hot Tub that comfortably accommodates six (6) people. This house is literally 8 minutes from the white sand everything you need is there! We enjoyed our time at this house which is fully decked out and includes a pool table for inside entertainment. We are looking for the next trip and would stay at this location anytime, this property is recommended. The hot tub was nice and but the pool was cold even for Ohioan’s. I thoroughly enjoyed staying at Kevin and Laurel’s place! They had everything we needed. The pool, hot tub and outside area were fabulous! We hope to be able to come back when red tide isn’t as much of an issue so we can get out and enjoy the beach as well. We loved having you! We look forward to seeing you in the future!! This condo was so convenient and extremely clean and comfortable! Great house with beautiful private pool and pool table inside. Owners live upstairs but kept to themselves so didn’t bother us when using pool. The beach is a 10-15min walk and pretty empty (no lifeguards, chairs for rent or any bathrooms). The public beach with bathrooms, lifeguards and showers was a 5min drive (too far to walk). The town (bars, restaurants, store) is a 5min walk, but recommend driving further away for better food. Really enjoyed our stay here! Only complaint is they don’t provide enough toilet paper so bring your own. Noted about the toilet paper, that won't happen again. I had left a couple rolls down there, but ran out of it. I forgot to put more down there once I bought it. If you don’t wish to drive. It’s a lovely walk to the shops and restaurants. The house was very clean beds comfortable. They had everything there (ie: beach cart, beach chairs) so that we didn’t have to buy anything extra. As before the kids loved being in the pool. We can’t wait to come back next year. Thank you Kevin and Laurel for sharing your home with us. It's always a pleasure having you stay with us. You and your children are such a delight. Thank you for for assistance putting the new recliner in. You are always welcome back, as you are one of our top favorite families to rent to! Enjoyed having you! Laurel was great!! We were there for my wedding and my group was a little louder than most and she was so patient with everyone. Highly recommend!! THE POOL IS NOT WINTER HEATED (Dec. - Feb). WE DO NOT PROVIDE BEACH CHAIRS. WE DO NOT ALLOW LOUD NOISE PAST 10 PM. THIS IS ALSO NOT A PARTY RENTAL (IF YOU WANT TO PARTY THIS IS NOT THE PROPERTY FOR YOU). Cancellation deposits are non-refundable within 60 days of arrival date. We charge an additional $10 per person per night for rentals exceeding 4 people.